" Horseshoe Cave - Turner Falls, Oklahoma - C. 1960. " (1647) POSTCARD: Horseshoe Cave - Turner Falls, Oklahoma - C. 1960. -Condition: Very Good. - Not Posted. 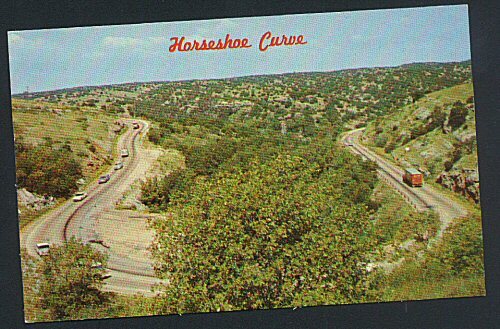 Photo of the famouse horseshoe curve near Turner Falls in Oklahoma. The road was actually built in the 1920's using convict labor who had set up a camp near by. For more information on the building of the Horseshoe Camp see Highway 77. Price: $3.00 + shipping.